Definition at line 1523 of file llmenugl.cpp. Definition at line 1562 of file llmenugl.cpp. Definition at line 1581 of file llmenugl.cpp. 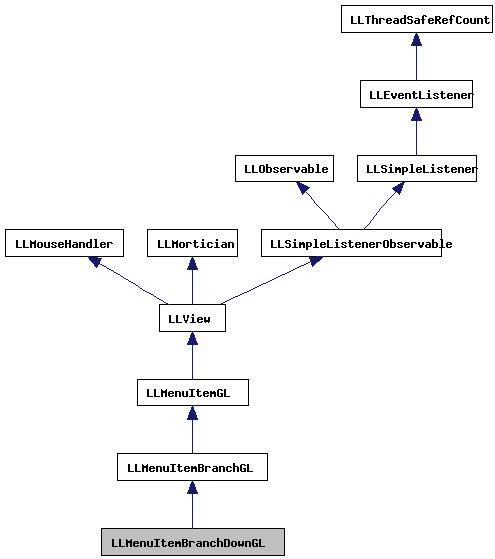 References LLMenuItemGL::appendAcceleratorString(), LLUIString::clear(), and LLMenuItemGL::mDrawAccelLabel. Definition at line 1761 of file llmenugl.cpp. References LLFontGL::BOTTOM, LLFontGL::DROP_SHADOW_SOFT, f, FALSE, LLView::getEnabled(), LLRectBase< Type >::getHeight(), LLMenuItemGL::getHighlight(), LLMenuGL::getKeyboardMode(), LLMenuItemGL::getMenu(), LLUIString::getString(), LLMenuGL::getTornOff(), LLView::getVisible(), LLFontGL::getWidth(), LLRectBase< Type >::getWidth(), LLFontGL::getWidthF32(), LLUIString::getWString(), gl_line_2d(), gl_rect_2d(), glColor4fv, LLFontGL::HCENTER, LLMenuGL::jumpKeysActive(), LABEL_BOTTOM_PAD_PIXELS, llround(), LLMenuItemBranchGL::mBranch, LLMenuItemGL::mDrawTextDisabled, LLView::mEnabled, LLMenuItemGL::mFont, LLMenuItemGL::mGotHover, LLMenuItemGL::mJumpKey, LLMenuItemGL::mLabel, LLView::mRect, LLMenuItemGL::mStyle, LLColor4::mV, LLFontGL::render(), S32, S32_MAX, LLMenuItemGL::sDisabledColor, LLMenuItemGL::sDropShadowText, LLMenuItemGL::sEnabledColor, setHighlight(), LLMenuItemGL::sHighlightBackground, LLMenuItemGL::sHighlightForeground, LLStringBase< char >::toUpper(), and TRUE. Definition at line 1573 of file llmenugl.cpp. References LLFontGL::getWidth(), LLUIString::getWString(), LEFT_PAD_PIXELS, LEFT_WIDTH_PIXELS, LLMenuItemGL::mFont, LLMenuItemGL::mLabel, RIGHT_PAD_PIXELS, and width. Definition at line 1534 of file llmenugl.cpp. Definition at line 1532 of file llmenugl.cpp. Definition at line 1531 of file llmenugl.cpp. Definition at line 1685 of file llmenugl.cpp. References LLView::getVisible(), LLMenuGL::handleAcceleratorKey(), LLMenuItemBranchGL::mBranch, and LLMenuHolderGL::setActivatedItem(). Definition at line 1698 of file llmenugl.cpp. References LLMenuItemBranchGL::doIt(), LLMenuItemGL::doIt(), FALSE, LLView::getEnabled(), LLMenuItemGL::getHighlight(), LLMenuGL::getKeyboardMode(), LLMenuItemGL::getMenu(), LLView::getVisible(), LLMenuGL::highlightNextItem(), LLMenuGL::highlightPrevItem(), isActive(), KEY_DOWN, KEY_LEFT, KEY_RIGHT, KEY_UP, LLMenuItemBranchGL::mBranch, NULL, LLMenuGL::setKeyboardMode(), and TRUE. Definition at line 1670 of file llmenugl.cpp. References LLMenuItemBranchGL::doIt(), FALSE, make_ui_sound(), LLMenuGL::setKeyboardMode(), and TRUE. Definition at line 1679 of file llmenugl.cpp. Definition at line 1662 of file llmenugl.cpp. Definition at line 1589 of file llmenugl.cpp. References LLMenuGL::arrange(), LLFloaterView::bringToFront(), FALSE, LLRectBase< Type >::getHeight(), LLView::getParent(), LLView::getRect(), LLWindow::getSize(), LLMenuGL::getTornOff(), LLView::getVisible(), LLRectBase< Type >::getWidth(), LLView::getWindow(), gFloaterView, left, LLView::localPointToOtherView(), LLView::localPointToScreen(), LLRectBase< Type >::mBottom, LLMenuItemBranchGL::mBranch, LLView::mRect, LLCoord::mX, S32, setHighlight(), LLRectBase< Type >::setLeftTopAndSize(), LLView::setRect(), LLMenuGL::setVisible(), top, LLView::translate(), TRUE, x, and y. Definition at line 1639 of file llmenugl.cpp. References LLMenuGL::clearHoverItem(), FALSE, LLMenuItemGL::getHighlight(), LLMenuItemGL::getMenu(), LLView::getParent(), LLMenuGL::getTornOff(), LLMenuItemBranchGL::mBranch, LLMenuItemGL::mHighlight, and LLMenuGL::setVisible(). Referenced by draw(), and openMenu().